Arabs love horses, falcons and yaa Allahi, FOOTBALL. It is definitely very hard to say who is more crazy about the round piece of leather, Germans or Arabs? Arabia is a melting pot for the nations – a tremendous place for an interactive relationships between religions, cultures, kitchens, art, music and lots more. In the United Arab Emirates we have around about 90 % foreign inhabitants from the total population of 9,346 million in 2013. The German expat community will be estimated somewhere between 12-20.000 persons. * It will be narrated the biggest German part is just from Hesse. In our new domicile Dubai there are 200 nationalities, and in our hometown Frankfurt am Main there are no less than 180 nationalities! And much to our delight since 14. Juni 2005 are Frankfurt and Dubai partner cities. See also the report and pictures about the visit of Frankfurt’s Lord Mayor in Dubai. As true Eintracht Frankfurt fans we want to leverage the huge potential of these commonalities. We want to promote our Eintracht Frankfurt globally, so that more and more people will associate our team with a positive spirit. and certainly we have a subsidiary in Germany. Of course we will continue our world wide acquisition and let the Eintracht eagle fly and the Bedu camel ride till the earth is not just red-black-white! 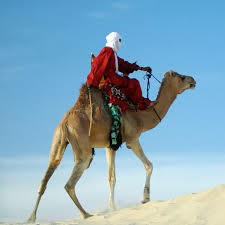 The Bedu rides on his camel for the Eintracht! So please feel challenged to join us and become active in one of our international groups. Or do you know what, be encouraged to set up a new one! *If you click on the read highlighted text, you will receive useful and interesting information about the topic.